HCHRA operates at the highest level of integrity and fiscal responsibility. Since 1996, HCHRA has consistently received a clean audit. For 21 consecutive years, auditors have reviewed our financial statements and found our records to be accurate, complete, and in accordance with Generally Accepted Accounting Principles. HCHRA is a public non-profit organization that fully complies with all IRS requirements.This includes filing and providing for public inspection the Form 990. For more detailed financial information, visit our reports & plans. Hinds County Human Resource Agency strives to ensure that its operations are carried out in a highly ethical, transparent and trustworthy manner. The vast array of community services and programs HCHRA provides are made possible by public and private donations, local, state, and federal grants and contracts. Shirley Gibbs is a graduate of Mississippi College and Jackson State University. She has seven years of experience in public education, and twenty four years of experience in governmental procurement. 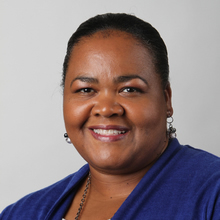 As a member the Mississippi Association of Governmental Purchasing and Property Agents, Shirley has gained additional training on federal, state and local laws, rules and regulations pertaining to contract procurement. She has received the HCHRA Agency Support Award, the HCHRA Board of Directors Awards, HCHRA Josephine Singleton Award and the HCHRA Administrative Staff of the Year Award. Shirley has been with HCHRA for more than twenty seven years, serving first as a volunteer Parent for the Head Start Program, then being hired as a Purchasing & Procurement Director for the past twenty four years. Robert Scott serves as the Head Start Grants Management Director for the Hinds County Human Resource Agency. Upon obtaining his Bachelors of Science Degree in Finance, he worked as an accountant with the Boston Gas Company in Boston, MA. Robert has been employed with HCHRA since October 1985. He started his career with HCHRA as an Energy Coordinator. After obtaining his Master’s Degree in Business Administration, he became the Head Start Grants Management Director in December 1990.